Waiting for him in ambush, several armed men aboard trucks opened fire on the Guadalajara police commander and two of his escorts when he arrived at his home; Dead at the site of the shooting, the commanding officer, two bodyguards and one of his companions. It was shortly before midnight last Tuesday, in the closed street Río Calderón at the junction with Río Mascota in the Urbi Quinta subdivision, in the municipality of Tonalá , where the commander named Sergio Rivas Mejía was attacked. 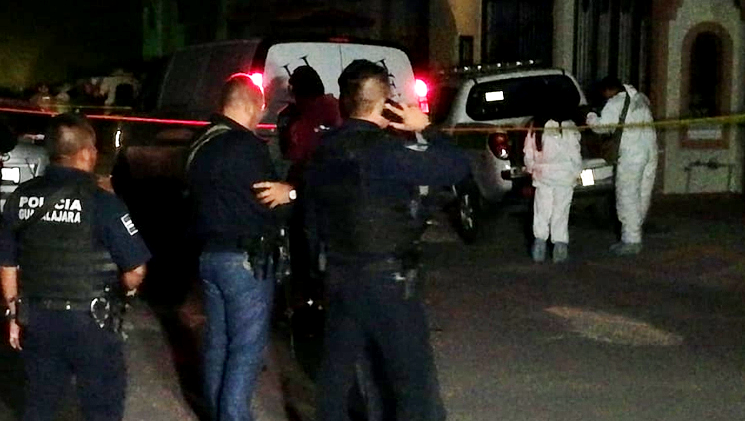 After the search efforts of the attackers by police of Guadalajara and the State, they managed to locate abandoned two trucks at the intersection of Ave del Paraíso and Tucán, in the Pinar de Las Palomas neighborhood, Tonala. Most likely than not them cops were crooks that work for a cartel. You basically have to be corrupt or u die. The cleansing of Mayo has begun. When will clean Mexico top brass, develop a better system of capturing criminals on the hot prowl. Good police, innocent people have been getting killed by the 100s, and yet when army,navy, Federal police arrive the suspects are long gone. Mexico is going backwards. The cartels operate with impunity throughout Mexico. Hardly any of the hundreds, no thousands, of killings are ever punished. I'm sure the police commander somewhere along the line was offered "lead or silver." Maybe he should have taken the silver! So sad, but yet so true. He was a dead man regardless. Either or one of the opposing sides was going to kill him. Giving up information meant certain death. Not complying was only going to result with the same outcome. Damn if you do, damn if you don't. damnED if you do, damnED if you don't! A fictitious propaganda campaign to gain an objective? So basically bodyguards are useless in mexico. When ambushed they are not effective. The magic word Mijo is Ambushed. @5:52 If bodyguards are useless, then how do Mexico's billionaires move around safely? You cannot stop a truly professional ambush with anything less than 8 bodyguards. Ive never killed anyone but I could single handedly kill anyone with 4 body guards. If someone has tbe ups on you then you go. Its as simple as that Just try not to panic when the bullets hit you so you yave a better chance of not bleeding out as you pray and wait for the paramedics. Its that simple. Best thing is: don't go collecting the mordidas with two bodyguards, demand direct deposit. Mayo is killing off everyone from cjng or having them arrested holy cow! Retaliation for catching el 20, cjng does that every time the cops bust cjng boss.. They must have been trying to double dip, Mencho has sent a message loud n clear, no one especially CDS steps foot in GDL! 1:16 dude mencho dont have no pull in guadalajara anymore he lost it to el cholo.. Please no own talk bad about la gallons mencho cause his people are going to get mad and go burn a bunch of cars and make a big seen . @5:33 so just because you kill a killer, it doesn’t make you a killer? 5:33 Jessie James Decker is alive, and kicking.